‘Whistle In The Dark’ is Emma Healey’s second novel. Her first novel ‘Elizabeth Is Missing’ was released in 2014 and it became a bestseller. I must admit that I haven’t actually read ‘Elizabeth Is Missing’ much to my shame but judging by how much I enjoyed reading this book, ‘Elizabeth Is Missing’ is not going to be on my ‘to be read’ mountain for much longer. I read the synopsis for ‘Whistle In The Dark’ and I just knew that I had to read this book. I thoroughly enjoyed reading it but more about that in a bit. The two main characters are a mother and daughter called Jen and Lana respectively. Lana has just surfaced again after having gone missing a couple of days before. Lana doesn’t want to talk about where she has been or what she has been doing. At times I wasn’t sure if it was more a case of she wouldn’t remember rather than couldn’t remember. Lana has some injuries but she can’t say as to how she has got them or what caused them. I get the impression that there is a gap opening up between Jen and Lana and in part that could be down to Jen being over protective of Lana and interfering in her life. I did feel for Jen and I can’t begin to imagine what goes through a parent’s mind when their child goes missing, but I think Jen is trying too hard to discover what happened to Lana during the missing days. Jen doesn’t always phrase things right and she can come across as being quite confrontational. What did happen to Lana during those few days she was missing? Will Lana and Jen ever repair their relationship? Well for the answers to those questions and more you are just going to have to read the book for yourselves to find out because I am not going to tell you. ‘Whistle In The Dark’ is extremely well written. The author grabs your attention from the moment you open the book and keeps you under her spell until the moment you finish reading. What I like about this story is the fact that the author writes about the events following Lana’s reappearance but at the same time she also has chapters which fill in the back story. This way of telling the tale works very well and the story flows seamlessly. I was hooked from the moment I picked the book up. The characters are so realistically written that they seemed to spring to life as it were and I began to think of them as real life people. There were times when I wanted to slap Jen across the chops with a wet fish for the way in which she spoke to Lana or because of something she had done. It didn’t seem to take me long at all to get through the book. Usually I have the attention span of a gnat but not in this case because I was so gripped by the plot and so interested in the characters that my sole focus was on the book. I managed to block out all other distractions which isn’t easy for me to do. The author writes about some pretty tough subjects, such as teenage mental health and self harm but she writes with great compassion and sensitivity. 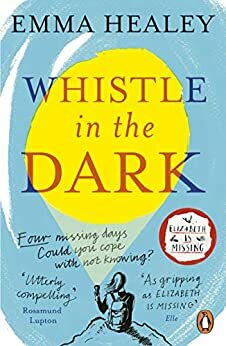 In short, I thoroughly enjoyed reading ‘Whistle In The Dark’ and I would definitely recommend it to other readers. I am definitely going to read ‘Elizabeth Is Missing’ as soon as I get a moment. I can’t wait to read what Emma Healey comes up with next. The score on the Ginger Book Geek board is a very well deserved 4* out of 5*.